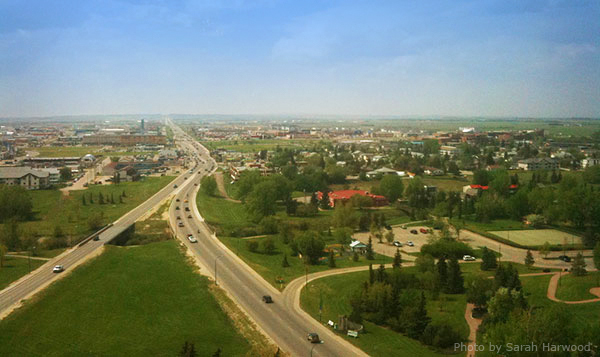 Grande Prairie (population 69,000) is 464 km northwest of Edmonton on Highway 43, about a 4.5-hour drive. As the centre of the region, it supports a surrounding population of 260,000 people. Both WestJet and Air Canada offer daily direct flights between YQU (Grande Prairie Airport) and YEG (Edmonton International Airport) and YYC (Calgary International Airport), both of which have connecting flights to just about anywhere in the world. Getting around town is made easier by renting a car at National Car & Truck Rentals which is conveniently located at the airport and features a special rate during the festival. Phone 1-888-532-3761 (toll free in Alberta and BC) or (780) 532-3761 Monday to Friday between 8:00am and 5:00pm and quote “Reel Shorts” to get the special rate of $29.95/day with 100 free daily kilometres ($0.25/km thereafter). Want to explore the history of the region? 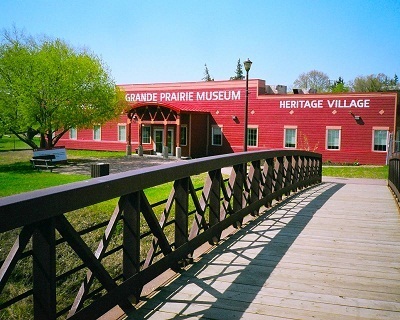 Check out the Grande Prairie Museum & Heritage Village in Muskoseepi Park, only a short walk northwest of Grande Prairie Live Theatre (directions). The first photo above is taken from the top floor of 214 Place facing west. The museum is the red building and Grande Prairie Live Theatre is just out of the picture on the left (one block south of 214 Place). The museum is open daily year-round and the Heritage Village opens in early May. It consists of 15 historical buildings and a display of antique farm equipment and vehicles that provide visitors with a glimpse of what times past were like. It was only 100 years ago that homesteaders traversed the Edson Trail to create a home for themselves and their families here in the Peace Region – a pioneer spirit that can still be seen today in a thriving entrepreneurial culture. Also nearby is the Grande Prairie Farmers’ Market – located at 10032 – 101 Ave, 4 blocks northeast of Grande Prairie Live Theatre – open Friday 4:00pm to 8:00pm and Saturday 10:00am to 3:00pm. A few blocks away is the Montrose Cultural Centre, home to Alberta’s second largest art gallery (Art Gallery of Grande Prairie – free admission!) as well as the Grande Prairie Public Library and a coffee shop. Want to bring your family along to enjoy the 6 packages of acclaimed short films chosen by teachers for students from Grades 1-12? These packages screen in the morning and afternoon during the weekdays of the festival for school bookings (the public is welcome to attend as well). 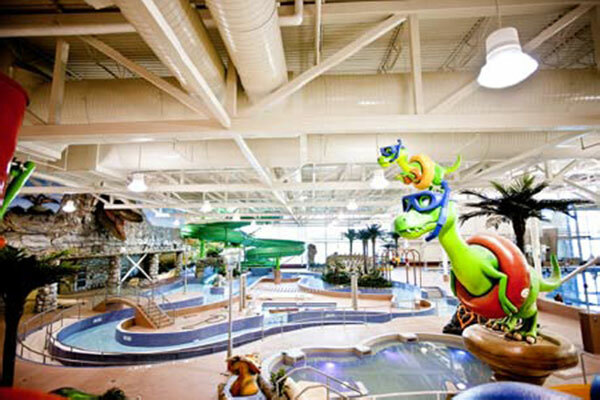 For fun outside the theatre, you can surf indoors at the Eastlink Centre which has aquatic and fitness facilities the whole family can enjoy. To find out about all the other things to do while visiting Grande Prairie, drop by the Visitor Information Centre located in Centre 2000 on the Highway 43 bypass (11330 – 106 Street) where you can find North America’s largest sundial, the Heritage Discovery Centre Museum on the lower level, and a great view from the top cupola. Or browse the Grande Prairie Regional Tourism website. The Philip J. Currie Dinosaur Museum is in Wembley, a 20-minute drive west of Grande Prairie on Highway 43. 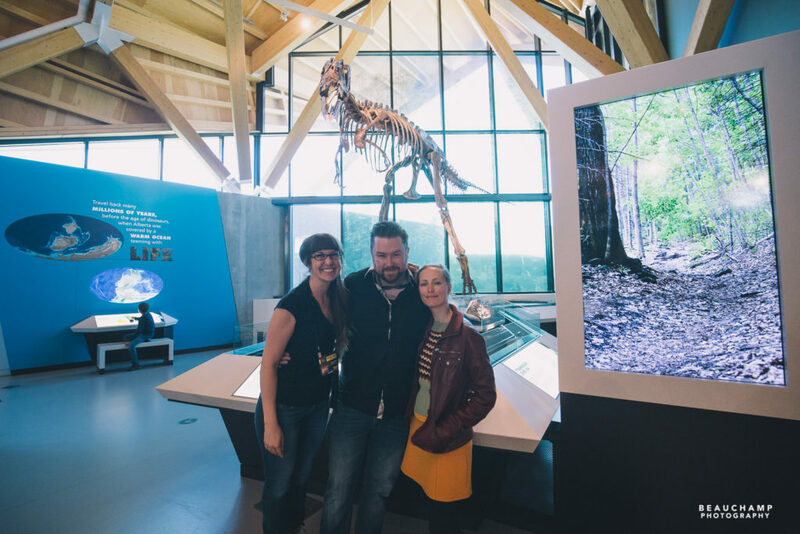 Hospitality Coordinator Laura Beauchamp (left) gives jury member Scott Belyea and actress Kristiane Nerdrum Bøgwald (Skinless) a tour on Fri, May 13, 2016. Dawson Creek is an hour drive northwest of the dino museum and it is Mile 0 of the Alaska Highway which extends to Delta Junction, Alaska via Whitehorse, Yukon for a total length of 2,232 km (1,387 mi). Want to enjoy the long daylight hours and nights that can be radiant with the Aurora Borealis while on a wilderness adventure after the festival? Contact the folks at Horse Trekking Adventures at (780) 835-4629 to arrange a trip into the boreal forest throughout the Peace Region or a longer trip into the Rocky Mountains. Or take a drive through the mountains. A scenic 2-hour drive south on Highway 40 takes you to Grande Cache, home of the Canadian Death Race. Drive another 2 hours south to get to Jasper. The charming cabins and rustic elegance of the Jasper Park Lodge combine for a perfect getaway or family vacation. Drive another 3 or so hours to get to Banff, which is an hour drive from Calgary and Canada’s fourth busiest airport. The historic Banff Springs Hotel, the majestic “castle in the Rockies,” is a UNESCO World Heritage Site and has been providing hospitality to guests for 125 years. 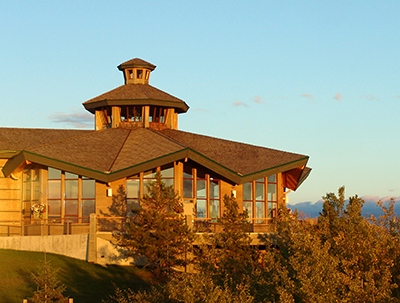 Or enjoy a stay at the Banff Centre, the largest arts and creativity incubator anywhere. Its 43-acre campus, just a few blocks from downtown Banff, has hosted over 8,000 artists, leaders, and researchers from across Canada and around the world. Media + Production programs, including artist-in-residence programs, are among the many arts programs available. 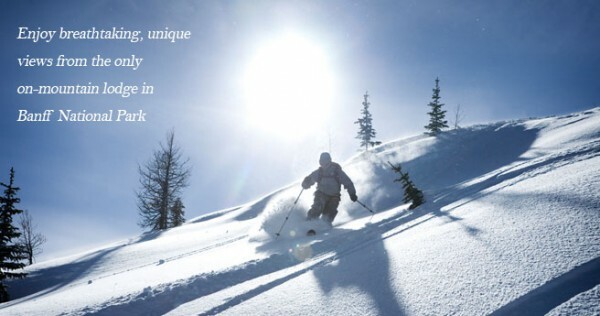 Or enjoy spring skiing right up until the May long weekend (3rd Monday in May) at Sunshine Village. The Sunshine Mountain Lodge is a ski-in, ski-out hotel so no need to drive once you’re there!